Halloween is just around the corner, so it's time to get going on all the festivities. This delicious and simple marshmallow rice krispies treat is a great way to get into the Halloween spirit! 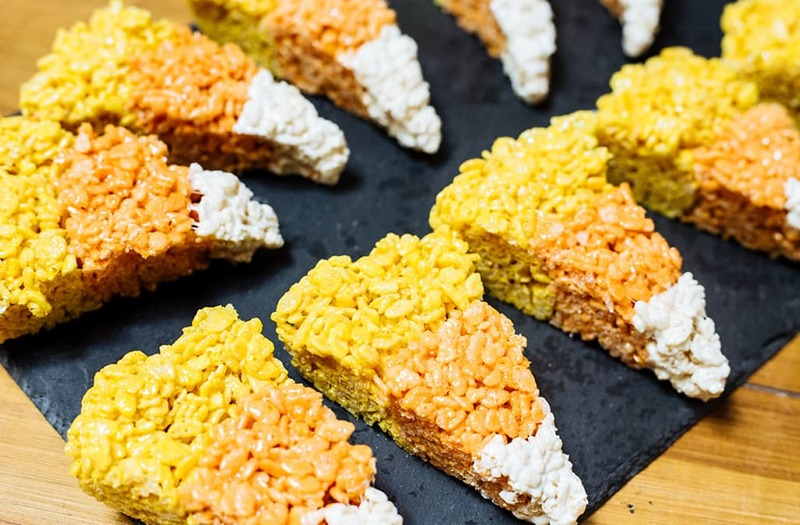 Shaped and colored like candy corn, it's sure to be a hit at your party. Stir, stir, stir until melted. Pour out half into a bowl and add 10 drops of yellow food coloring. Stir in cereal and mix well. Scoop into a dish and flatten into a ring. In a separate bowl, add 10 drops of yellow and 6 drops of red to marshmallow mix. Add in 2 1/2 cups of cereal. In another bowl, add 4 drops of white food coloring. Mix in 2 1/2 cups of cereal.